Do you want a roofer that can provide you with residential or commercial roofing in Brenham, TX? Dial (833) 200-0571 today to speak to ECO Commercial Roofing for any and all of the roof services you need! We can assist you with any type of roof service, and our crew is committed to customer satisfaction at all times. We’ve been business and home roof contractors in the Brenham area for years, and our professionals are established members of this community. Our contractors are extremely knowledgeable on the various types of roofing, and we’re glad to help you with any of your roofing questions or concerns. Choosing a reliable roof contractor is always easy when you count on ECO Commercial Roofing! Your roofing plays a significant part in defending your property, so it is of the highest importance that you employ a contractor you can rely on. Each of our contractors goes through training to industry standards, and we make sure to only purchase top quality products from brands such as Conklin. We know that the roofing you choose can alter the value of your property too, so we offer several different roofing materials for you to choose from. As far as benefits, be sure to consider the longevity and the performance with the same scrutiny that you choose the aesthetics. Your decision should also fall in line with the kind of roof you will be covering, and your set budget for roofing. Luckily, our team can give you tons of options. Regardless of what your needs are, from repairs to replacements, our job is to help you get precisely what you’re looking for. Our experience allows us to service any kind of roof, including business, industrial, and home too. Primarily catered towards flat roofs or low slope roofs, our commercial services are the ideal choice for most business owners. Ponding and leaking are both expected with flat roofs, but an expert installation is the first step in completely avoiding problems like those. 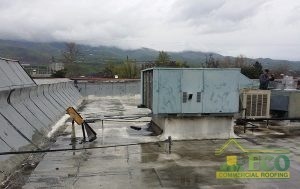 Industrial roofs, while similar to commercial roofs, actually require stronger materials, as well as highly skilled installation to ensure longevity. Last but not least, our residential roofing services can help with a variety of residential roof types and materials, with anything from repairs to installations. As a whole, our roofing company specializes in high quality roof restoration, and of course, roof coatings. In our expertise, using high quality materials such as Conklin can truly mean the difference between a roof coating that lasts, and one that doesn’t. In order to provide top of the line roofing in Brenham, TX, our crew works hard to deliver incomparable client satisfaction, with the assistance of detailed craftsmanship and expertise. To find out more about our Conklin roof coatings, or to ask questions about our roofing restoration techniques, give us a call at (833) 200-0571! If you are looking to repair minor damages on your building’s roof, as well as to defend it from further damages, a roofing restoration is a fantastic place to start. Your roof can continue to server for an additional decade with the help of one of our Conklin roof treatments. If you pick a roof restoration service in lieu of a roofing removal and installation, you’ll get savings in both time and cash! The majority of our roof restorations are finished utilizing Conklin’s high quality roof coating materials. You can depend on our contractors to help you decide which of our many roof coating options will work ideally for your needs. Some roof coatings apply to materials such as rubber better than others, and some deliver better water resistance for damp climates, so it’s important to choose the right coating carefully. In many cases, the roof coating is installed directly to the previous roof’s system. To discover more, contact our team now at (833) 200-0571! Acrylic Roofing Alternating temperatures require dependable roof coatings such as acrylic, which are quite flexible. 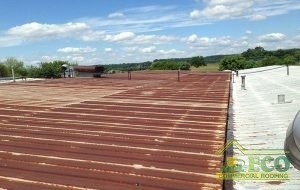 We service several kinds of commercial roofing options, such as flat roofs and low slope roofs. Proper installation is key if you want to avoid problems such as leaking, punctures, and early failure. When we create a flat roof system for a client, we build that solution to protect and serve their structure for years. For all of your reliable commercial as well as residential roofing requirements, call on the experts at ECO Commercial Roofing! We don’t only provide our expert roofing in Brenham, TX, but also in the surrounding areas. Any building can hope to gain from the installation of a high quality roof investment. To find out how our team can properly serve you, give us a ring at (833) 200-0571, and we’ll schedule your appointment as soon as possible.